Wouldn't it be nice to get a "no"? I have not had good luck getting a response from companies. I was wondering when people would expect a response and if there are any tricks to getting said response. 2. After phone / screening interview -- would expect a response here, don't usually get one. 3. After on-site -- definitely expect a response, usually receive a response but not always. When I don't get a response I've e-mailed HR / hiring manager (first step) and then followed up by calling and leaving voice messages, but still get nowhere. I guess I am receiving an answer, but an actual "No, we are not interested anymore." would be appreciated. I think I've gotten a response to every on-site, even though one of them was a very short, curt e-mail from the manager. One time, I actually received a very nice call from the president of the company telling me "No, we're looking for someone with more experience." after what I thought was a fairly decent interview. Ah, well. I think the saddest response I've gotten was a short letter in the mail that was a copy of a copy of a copy of a copy of a "no, thank you" letter. I think it may have even been misaligned, which was adding insult to injury. It's too much to think that we could change the way companies worked, but readers of this blog, I beg you! If you've decided on a candidate, yes, tell him or her, but don't forget to tell the candidates that didn't get the position, either. At St. Barnabas Hospital in the Bronx, a dozen radiologists in training, including Dr. Luke Gerges, 28, are suddenly stranded on an expensive road to nowhere. All received termination notices recently because their hospital is ending their residency program next year as part of a plan to replace its radiologists with a teleradiology company that reads diagnostic images remotely. “Those days of raking in the dough with radiology are gone,” said Dr. Gerges, who is four years beyond medical school and $300,000 in debt. He said he chose a specialty he loves without caring that big salaries were waning, but never imagined it would be this hard to finish his postgraduate training and get a job. “No one is going to hire me to be a radiologist without my training,” he said. Few specialties have been immune to the same factors depressing radiology: deep Medicare cuts, cut-rate competition driven by technology, doubts about the health value of many tests and procedures and new measures to tilt public money to primary care. One hospital, McLaren Macomb, in suburban Detroit, instead offered several residents slots in its “unfunded program,” in which most radiology residents essentially pay for their own positions through donations, typically from a spouse or parents: $65,000 a year to cover a $42,000 salary and $2,000 for expenses. “Obviously it would be your last choice, but if there are no open funded positions and you can scrounge up the funds, keep it in mind,” the program director, Dr. Eli Shapiro, wrote in an e-mail to Dr. Gerges. What is the hiring process in Big Pharma? 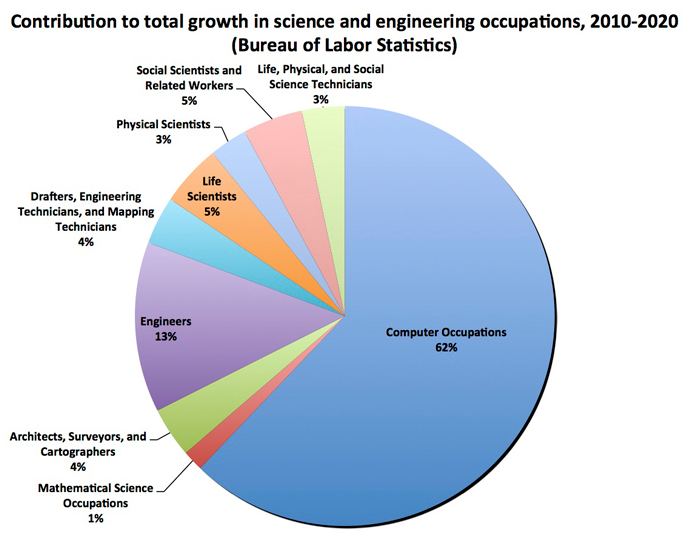 I imagine that people (perhaps at the VP or director level) decide that they need more scientists. Following this, I suspect that job descriptions are sent to the HR folks for posting, and coordination is made to forward incoming resumes from HR and other employees to the relevant hiring committee. After short lists are made and phone screenings are done, I suspect that 2 or 3 candidates are brought in for interviews and then the hiring committee makes their decisions. I'm probably giving the process short shrift, so I'd love to hear from readers who've participated in hiring in Big Pharma. I am a 50-year old industrial chemist. I am blessed with an excellent resume. I went to great schools, had pretty good grades, got a Ph.D. and have worked for desirable companies. I've been awarded patents, published papers, given presentations, etc. I'm a member of multiple professional societies. In short, I have a great resume. I also keep up on the literature. I'm a new employee’s worse nightmare: I know everything they do and more. Plus I have experience. Interviewers, recruiters and HR people all have told me that I have a great resume. While that is important, I've had a trump card in my pocket for getting a job. I kill at interviews. Whenever I’ve gotten an onsite interview, I always received the offer. Always. Then something happened recently that changed this. It started innocently enough when after an onsite interview, I didn't get the offer. OK., all streaks must end. I really wasn't concerned until it happened a second time, and then a third time. It's happened so many times now that I have to stop and think about what the exact number is. I'm sure CJ has younger readers who think that at 50, I am getting ready to retire. No. I'm old enough that I can't collect full social security until I am 67. That means that I am working for at least 17 more years. 17 years! Think about it. I've only worked for 23 years. I'm barely halfway done with my career. Retirement is not in the picture at all. I also doubt that any employer looking at hiring a younger person expects them to stick around 17 years. I started becoming concerned with the difficulty of find my next job, but another thought has arisen that has totally scared the living-daylights out of me: I now realize that there are very few moves left on the chessboard for me. If you're not familiar with the game of Chess, let me explain. People who study the game generally break it into three different phases. First there is the opening. This is usually the first dozen or so moves that each side makes. It is usually as tightly choreographed as a Broadway musical number. White does this, then black does this. There is very little thought involved since the opening are usually memorized from books. Next comes the middle game. This is the exciting part plans are laid and put into action, traps are set and most of the pieces are captured. Books can provide guidance, but the options are many and it is often difficult to see what the correct move is except with hindsight. Finally there is the endgame. This is when there are few pieces left on the board. It is impossible to predict at the opening of the game what pieces will be left in the endgame and where they will be, but that doesn’t prevent people from putting intense effort into studying endgames. What’s ironic is that the endgame is usually just as tightly limited in choices as the opening is even as it appears otherwise. The board is wide open so that a lot of moves CAN be made, but most of them are bad moves. There are very few correct moves in any given situation. Very good chess players will never finish a game entirely. Once the endgame is presented, it is pretty academic as to how it will turn out. The players acknowledge this outcome and end the game. I now see that my career has been like a chess game. In the beginning, I did what everyone else did. I applied for jobs in my field, hoping to get an entry level position. Every newly degreed person does the same thing using more or less the same procedures. This was the opening. Then I got to the middle of my career where after having gained some experience, I started to move around through promotions, lateral transfers within a company and leaving for another company entirely. There were lots of options to consider. While the moves I made usually seemed like good ones at the time, it is only with hindsight that I can see which ones were truly good and which ones were awful. And now I am at the endgame. I am sure that I will eventually find another job, but I can see already that that's going to be it. Wherever I end up will most likely be my last job. The next employer will keep me until I retire or am laid off. That's what scares me. Not only do I now have to hope to get an offer, but I have to decide if that employer and I are going to want each other for another 17 years. Because if it doesn’t work out, if I get laid off before my 17 years is up, I may never be able to recover, and that’s what really scares me. My search goes on, but it is a far more serious venture than ever before. These additional worries are now hanging over me, and they will never go away. So this is my situation. I’ve always heard that finding a job is more difficult for older workers and I find that to be true, but I’ve never really heard others describe this phase of my life, at this young age of 50, as the endgame: that there are few moves left, that every move now is critical, and how scary the recognition of that is. Thanks to NJ for an excellent essay. I obtained my Ph.D. in chemistry at the University of Texas at Austin, and my classmates are now my lifelong friends. While most of us weren’t aiming for academic research jobs to begin with, our stories illustrate a number of intriguing, challenging, and fulfilling nontraditional paths for science Ph.D.’s. One friend runs a biomanufacturing center at an Ivy League university. Two are project managers at a nonprofit contract research organization; one of these was awarded a Fulbright fellowship to study women’s access to STEM careers in the Middle East. One worked at the bench at a major pharmaceutical company for a decade before becoming an in-house patent associate. Another earned a J.D. and became a patent attorney. And the two friends who earned M.S. degrees? One is a manufacturing plant manager, and the other is the only one of us still at the bench doing syntheses. Me? I’m an entrepreneur. Or as I sometimes say, I’m CEO, principal investigator, and chief bottle washer of Arctic Inc.
Perhaps because I hope to stay close to the bench (the "research track", as it were), Dr. Stewart's paragraph offers me little comfort. Nevertheless, it sounds like she and her friends have had interesting and successful careers. Read the whole thing. Good morning! Between March 26 and March 27, 188 new positions were posted on the C&EN Jobs website. Of these, 5 (3%) are academically connected and 164 (87%) are from Kelly Scientific Resources. Whoa: Just when you thought it was safe to scroll down, Kelly Scientific dumps 164 positions on C&EN Jobs. They're mostly relevantish, so that's nice. Greensboro, NC: Syngenta Crop Protection is looking for a Ph.D. analytical chemist for analytical work towards agrichemical formulations. 65-107k offered for this position, which is quite the range. Chicago, IL: Polyera is back, looking for Ph.D. synthetic polymer chemists; sadly, this ad (although it calls for Korean-speaking ability) is not at "romance novel" levels of enthusiasm. Patrick AFB (: The Air Force Technical Applications Center is a regular (once a year or so) visitor to ACS Careers/C&EN Jobs. They have 4 positions posted, including one for a lead mass spectrometry scientist. All you need is knowledge of radiation detection and the ability to gain a TOP SECRET clearance. Hong Kong, China: The Hong Kong Jockey Club is looking for a M.S. chemist to test for banned substances in the racing horses. No, really. Excellence in Chinese (Cantonese, one imagines) is desired. Pleasanton, CA: Clorox is looking for a Ph.D. analytical chemist for a 1 year postdoctoral position. Pittsburgh, PA: PPG is looking for a Ph.D. synthetic organic chemist for a position working on "photochromic ophthalmic products." Rolla, MO: Brewer Science, back again with 3 positions. ACS NOLA Career Fair Watch: 56 positions for the Career Fair, 11 for the Virtual Career Fair. Good morning! Between March 21 and March 25, there were 27 new positions posted on C&EN Jobs. Of these, 14 (52%) were academically connected. There were 2 (7%) positions from Kelly Scientific Resources. By contrast...: Gilead Sciences has a similar position and yet manages not to fall all over itself. Economists get a look at future economic growth by tracking the sale of chemicals and the state of the chemical industry. Kevin Swift of the American Chemistry Council developed the index, and said it points to modest growth over the next six to nine months. "Generally expanding activity, into the third quarter, almost into the fourth quarter, signaling growth that would probably be about 2.5 to 3 percent in terms of industrial production," he said. Swift says chemicals are used early in nearly every industrial process, which gives experts several months notice of changes in the direction of economic growth. If manufacturers want more materials, they may have orders for more products. If chemical sales fall, then the economy is probably slowing down. So far, the US appears stronger. But the blog has always worried that today's apparent recovery has been heavily influenced by political developments, with the administration naturally doing everything it could to support the economy in the run-up to last November's presidential election. And Q1 railcar loadings, "the best real time indicator of industry activity" according to the American Chemistry Council, are down 1.4% versus 2012. Q2 could be very difficult indeed, if today's lower level of demand continues. January and March are normally 2 of the 4 strongest months in the year. Yet as the chart above shows, prices for the products in the blog's Downturn Monitor portfolio are all now falling quite sharply. Yet financial markets continue to assume 'all is for the best, in the best of all possible worlds'. US inventories rose by an astonishing 1% in January (twice the expected amount, according to Bloomberg). Yet this was taken as a sign that companies was stocking up ahead of an expected boom. More likely, however, it indicates that sales were actually much lower than expected. This is further confirmation, if any were needed, that oil and western stock markets have lost their essential role of price discovery. Instead they are being carried along on a flood of central bank liquidity. The moment when they reconnect with reality could well be very painful. I love how Hodges uses an ACC number to justify his relatively downbeat analysis for 2013. I have no idea how the economy looks for Q3 and Q4. My guess? Muddling along (i.e. GDP growth at about 2% or so.) If I had to pick a direction, up or down, I'd pick up. Process Wednesday: how long to deoxygenate 1000L IPA/water with N2? Having established the important role of dissolved oxygen in promoting formation of dimer 6, we sought to directly measure* and identify an upper maximum limit for dissolved oxygen. Three one-liter-scale experiments were completed in order to assess the efficiency and feasibility of deoxygenation using subsurface sparging. In these experiments, a mixture of water and 1-propanol was saturated with oxygen by subsurface addition of air, resulting in measurement of 8.3, 8.7, and 8.6 ppm oxygen. Nitrogen gas was then introduced at a rate of 0.5 standard cubic feet per hour (SCFH) resulting in reduction of dissolved oxygen to less than 0.5 ppm in 2.5 min. Thus, at 0.5 SCFH for 2.5 min, a total of 0.02083 standard cubic feet (SCF) of nitrogen was required to deoxygenate 1 L of solution. On this basis, we calculated that for 1000 L of reaction a purge rate of 30 SCFH of nitrogen for 41.7 min would be required to reduce the oxygen level from saturation to less than 0.5 ppm. Measurement of the recovered solution volume indicated that solvent loss due to evaporation was approximately 0.8%. We concluded that deoxygenation via subsurface sparging would be efficient and practical for large-scale work. *An ICM model 31250 dissolved oxygen probe and meter was used for laboratory work. Devices such as Metler-Toledo InPro 6800/6900 or InPro 6800 Gas may be found more suitable for manufacture of clinical material. Ultimately, the authors end up doing this in their sub-kilo reaction (5.8 L solvent, 800 grams of SM) and getting a 93% yield. The concerns that I see with doing subsurface sparges of nitrogen on scale (apart from the loss of solvent from evaporation (problem should not scale?)) is the possibility of aerosolizing material and losing it to upper parts of the reactor. Miller, W.D. *; Fray, A.H.; Quatroche, J.T. ; Sturgill, C.D. "Suppression of a Palladium-Mediated Homocoupling in a Suzuki Cross-Coupling Reaction. Development of an Impurity Control Strategy Supporting Synthesis of LY451395." Org. Process Res. Dev. 2007, 11, 359-364. Good morning! Between March 19 and March 25, there have been 20 new academic positions posted on the C&EN Jobs website. Bonn, Germany: The University of Bonn wishes to hire an associate professor of organic chemistry. West Lafayette, IN: Purdue is hiring for a cell culture facility; there are two positions posted, including a M.S./Ph.D. protein mass spectrometry-related position. Bridgewater, VA: Bridgewater College is searching for a one-year visiting assistant professor of physical chemistry. Just remember, when people talk about STEM, they're really talking about TE. The editorial about awards season prompts my every-five-years-or-so harangue about the awards given by the American Chemical Society (C&EN, Jan. 21, page 3). The majority of ACS members work in industry; a minority work in academia. The vast majority of ACS awards go to academia. As one distinguished academic colleague told me recently, “All we do is get awards.” Indeed. Occasionally an industrial chemist or engineer will win an award other than the industrial chemistry award. Here is the message ACS is delivering: The best of the best work is in academia. I am a 30-plus-year industrial bench chemist. You know, bench, where actual chemistry gets done. I tell my colleagues that a Science paper, the endgame in academia, is a good start! Folks, the chemical enterprise provides actual material solutions critical to society’s needs. To say that only research from academia is award-worthy is wrong. I've long been convinced that these awards are basically some sort of in-group sort of thing. I suppose what this means is that the academics are better at establishing those sorts of awards and handing them out. Beth Halford has a terribly interesting article about lithium and bipolar disorder. This is a very cutesy story about Djerassi and Hoffman; it's nice to see old dudes with whimsy. Lisa Jarvis's summary of last week's AstraZeneca doings. Yikes, that's almost 5,000 pharma jobs (not just chemistry) in one week. I wonder how shale gas is going to affect overall chemist employment. It's not like laid-off pharma folks can work in shale gas, right? But I wonder if these crackers (and the R&D that's going to happen around them) will employ chemists....? Are analytical chemists/analytical equipment manufacturers more sensitive to government budget problems? - On-site #2 interview with "homework", related to the non-bench component of the job, ~5 hours + ~12 hours of "homework"
If I wasn't desperate to pay the rent, I would have told them to take a flying leap after the third on-site. At least one job from this place has been featured on this blog. I cringe, because just about every interview they had, from fresh BS to experienced PhD followed this sort of routine. 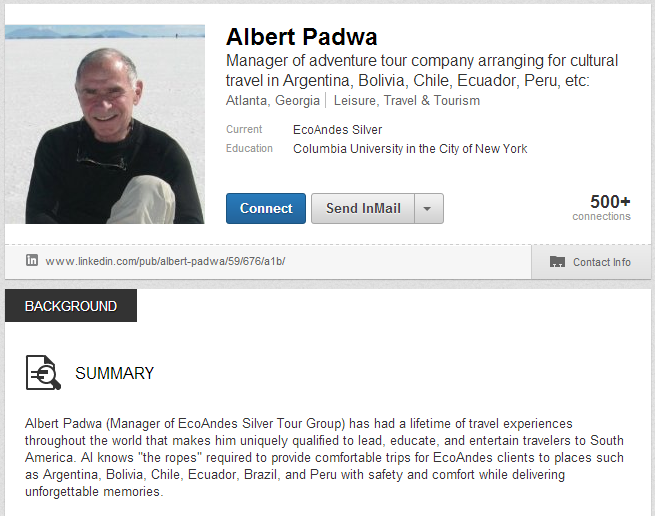 One candidate sat in an office and worked on "assignments" for an entire week (without pay!) as part of the evaluation process. Good God! That is terrible and makes all the interviews I've ever been on look great by comparison. AC, if you'd like to collect your award of a post on any subject you desire, a card written by me, a stack of the finest Chemjobber business cards and 8 ounces of hard candy, contact me via e-mail at chemjobber -at- gmail/dot/com. Advice for someone new to the workplace? I recently got a question about how newly hired people, fresh from academia, should act in the workplace, specifically address clothing and work hours. Regarding clothing, I've really adhered to "business casual", i.e. no jeans, khaki pants and a button-down shirt for my wear. That's the extent of my knowledge. As for hours, I like arriving earlier than my coworkers and leaving about the same time, but that has to do with enjoying sitting at my desk when no one else is around. Introvert much? Isn't this just a case of failed QC specs? Even novice shoppers know to wiggle around in a pair of pants before you buy them. But that was a lesson that Lululemon Athletica overlooked when it stocked too-sheer yoga pants, leading to a product recall, an expected hit of around $60 million in lost sales, and the risk that Lululemon — a widely envied retailer — has at last given competitors an opening. The company is recalling yoga pants made with a fabric known as Luon that are overly transparent, which make up about 17 percent of all the Canada-based retailer’s women’s bottoms. Lululemon’s chief executive, Christine Day, said Thursday that the company did not know exactly why the quality had gone awry, as the pants had passed quality-assurance tests. But she added that “the truth of the matter is that the only way that you can actually test for the issue is to put the pants on and bend over,” which the company did not do until too late. "The only way that you can actually test for the issue is to put the pants on and bend over," she said on the call. "It wasn't until we got into the store and started putting it on people that we could actually see the issue." As for quality control, "We've had a standard metric-based system ... for a very long time that controls it within the environment at the manufacturer," Ms. Day said. But there are "a couple of gaps that we found" that are harder to measure and really are more subjective," she said. "And that's certainly one area that we feel that we can do a better job of controlling.... We have to do a better job of controlling or creating standards for that process as we're shipping to more locations to manufacture." If the material is too thin (or is see-through when stretched), isn't this an easily solved QC problem? I would think you could weigh the fabric (or the pants) or you could stretch out randomly selected batches of cloth to see if you could see through them. Mannequins, maybe? Surely Ms. Day is not suggesting that she has to hire people to actually try on every single pair of yoga pants. What I find most interesting about this issue, from a manufacturing standpoint, is that people are speculating that this happened because they started to work with new suppliers and scale up their production. I'm glad to know sudden, out-of-nowhere specification surprises don't just happen when scaling up chemical manufacturing. What should a newly hired scientist do with their money? I'm wrapping up a doctoral degree in the physical sciences and heading to an industrial job in a few months. My grad school years have been spent in one of the highest cost-of-living parts of the States, so my individual savings aren't in great (mid four-digits), but I'm mid-twenties and thankfully debt-free (no student loans, never carry a credit card balance, car bought with cash, etc.) My new job will be both in a much lower cost of living state and a significant step up in salary at a little under $100,00/year base + signing bonus + potential annual bonus, dependent on company performance and my personal success or failure. The company offers a 401k with a mixed match (I put in 6%, they fractionally escalate until they've matched 4%) and discounted stock for employees. Health and dental carry a modest deductible but the coverage is good. I've gotten by for a little under a decade as an undergrad on scholarships and lab assistant support and then as a grad student on fellowships and TA appointments; now that I'm slogging through my dissertation I'm starting to dream about how to structure my finances once I actually have finances to think about. I've been in school longer than most so I know I'm behind in starting major retirement savings, but the emergency fund will have to be bumped up first. Industrial research jobs are growing less stable than they once were, so I'm wary of locking myself too much into the company's system beyond what I need to get the match. I'm also likely renting for the first few years as I'm not sure if I'll be settling at that particular site long enough to merit binding myself with a mortgage to the local real estate environment. If you were in my shoes and starting your first outside-of-school job, how would you allocate things for the first few years? An emergency fund with 6 months worth of expenses. All in all, fairly prudent advice, I'd think. Read the whole thing. ChemProfCramer's comment on PIs and helping with "the next job"
So, colleagues around the U.S. (to be honest, I think this is a pretty American problem -- my experience in Europe is that ties in research groups are much stronger), I exhort you to treat your students and postdocs as the most precious raw material that you will ever have the chance to refine and polish. If they do great work in your labs, good for you and them, but if you also facilitate their ability to do still better work as they transition to their own, independent careers, your opportunity to bask in their reflected glory will be at least as rewarding, if not more so. Investing time, effort, and maybe even a little bit of empathy, is simply the right thing to do. Lots of faculty obviously get this, but a disturbingly large number seem not to. How hard did real estate hit thirty-somethings? [snip] The Urban Institute calculates that $42,000 in wealth can be lost if you buy a house when you’re 40 rather than 30. The problem is that this number comes from using data from the “past few decades”. Price appreciation during those few decades, we now know, was an anomaly. ...the housing market crashed just as today's thirty-somethings were getting into it. As a result, they found themselves in lots of debt and with very little to show for it. As the real estate researchers at Zillow reported in August, homeowners in their thirties are still the most likely to be underwater on their mortgages. [T]today's thirty somethings are climbing out of a deep enough hole that they may never become as wealthy as the boomers unless home values rebound dramatically, and even then, many will only be getting back to even. I wonder if thirtysomething scientists are doing better or worse than their non-science counterparts in their age cohort in terms of wealth and income. It's probably a mixed bag, right? Those who are working at full-time positions are probably doing okay, mostly, while those struggling in postdocs just aren't. Hello! Between March 19 and March 21, there were 23 new positions posted on the C&EN Jobs website. Of these, 5 (22%) are academically connected. Groton, CT: Pfizer wishes to hire a Ph.D. analytical chemist; UPLC, HPLC experience desired. Interested candidates should have a strong background in sol-gel chemistry. Practical laboratory experience in the preparation, formulation, and application of sol-gel based materials is required. Preference will be given to candidates with experience in the development of sol-gel based coatings. I would be very interested in knowing how many people this might apply to. 100? 200? 500? Knowledge of the chemistry and industrial applications of elemental phosphorus and derivative compounds, phosphorus pentasulfide, phosphoric acid and phosphate salts preferred. They'd like 2+ years of working experience outside academia, but it doesn't sound like a requirement. You guys again: Anichem (North Brunswick, NJ) is hiring B.S./M.S./Ph.D. synthetic organic chemists. Their salaries don't look all that hot, that's for sure. Now there's a range! : Sun Drilling products wishes to hire a QC/QA manager; they're a company that works on drilling fluids and other oilfield products. 1-5 years experience in manufacturing desired. 50-100k offered. I wonder what qualifications are needed for 100k? UK postdocs interested? : AstraZeneca (ironically enough) has decided to post 4 postdoctoral positions in molecular biology or biochemistry in the UK area. All in Cheshire, actually. Hey, isn't that the site that just shut down? Yes, yes it is. We need to fill this position ASAP, so please send your CV and letter of interest to nlents -at- jjay.cuny.edu without delay. The postdoctoral labor market in chemistry: opaque? I've heard professors complain that they don't get good postdoc applications. I wonder what would happen if they offered more money? Lots of synthetic postdocs, but some profs, even in good dpts, can't get applicants. Skeptical. NRC offers HUGE salary, and I've heard sponsors complain of poor applicant pools. $ not primary factor for most. & I guess I'd argue that they should compare their reputations against competitors. Its a buyers' market for the "best" PhDs. The postdoctoral fellowship labor market in chemistry seems to be a fairly opaque market on all sides. Students and their advisers don't really know when they're going to graduate and may be loathe to even broach the subject (I know I was a little nervous about it, and I considered my relationship with my PI to be better than average.) Not everyone wants to do a postdoc, and I suspect that given the option, most would not. Salaries aren't really discussed (they're all crummy!) and it is not commonly known who has an opening and who does not. (Professor Cramer noted that he's never advertised, yet gets multiple applications a week.) While the "rumor mill" probably has a fairly decent bead on what is going on, it's not exactly the height of transparency. I wonder if there's room for someone (ACS, whomever) to facilitate a smoother process of applying for postdoctoral fellowships and for younger professors to get attention? I've followed the story of Professor Paul Frampton with some level of amusement. He was the tenured professor of physics who was convinced that a bikini model was contacting him through a dating service, and wished him to pick up a package in Buenos Aires and deliver it to her in Belgium. I know one of this guy's graduate students. Because Frampton was unavailable to supervise the completion of his dissertation and oral examinations, his ability to complete his Ph.D. has been delayed. UNC tried to find someone else to supervise him but apparently, not only was there no one else at UNC who do what Frampton did, but there were very few professors elsewhere who do what he did. (UNC finally found someone at another university to help him.) I don't know, but assume, that Frampton also had other graduate students whom he left in the lurch. Frampton may have deserved his prison sentence, but his stupidity hurt others as well. - Isis, New York, NY. No clue if it's a true story, but it's certainly believeable. What an unfortunate mess for the affected graduate student. Best wishes to them. *hat tip to Daniel Lametti for noticing/tweeting this. "Of all the gin joints, in all the towns, in all the world..."
You have been randomly selected to participate in the 2013 annual ACS Comprehensive Employment Survey. This survey has tracked chemical employment and salaries for nearly four decades. This annual survey is conducted under the guidance of the ACS Committee on Economic and Professional Affairs (CEPA). The data are an integral part of understanding the changing employment patterns of chemical professionals. The data help populate both the ACS Salary Comparator as well as the ACS Employment Dashboard. Your participation is essential regardless of your current employment status. Good morning! Between March 14 and March 18, there have been 37 new positions posted on the C&EN Jobs website. Of these, 14 (38%) are academically connected. Watertown, MA or Branford, CT: Forma Therapeutics has posted a healthy number of positions for medicinal chemists on its website. Actually, there's just a crapton of chemistry positions in general, analytical and computational. Mostly seem to be oriented towards experienced people, though. Torrance, CA: Phenomenex, back again with its usual suite of positions. What are they about, anyway? Hiring lots of new people, or they can't fill these sol-gel positions? Sandy, UT: Got a M.S./Ph.D. in analytical chemistry? 4Life Research is looking for you to be a QA/QC/cGMP manager. $90k offered, which is a nice salary for sure. I believe they're a supplement company, and one of the less savory ones at that. Irvine, CA: Allergan is looking for a M.S./Ph.D. chemist to be a formulations scientist. Bartlesville, OK: Chevron Phillips is looking for a Ph.D. polymer scientist; 5-10 years experience desired. China Corner: Lilly is looking for positions in medicinal chemistry and process chemistry for its Shanghai facility. ACS NOLA Career Fair Watch: 42 positions for the Career Fair, 7 positions for the Virtual Career Fair. Atlanta, GA: Georgia Tech is searching for a postdoc for the laboratory of Prof. Stefan France; "The postdoctoral researcher will develop synthetic organic methodology focused on novel targets in Chemical Origins of Life." Los Angeles, CA: UCLA is hiring for a postdoctoral Cram Teacher/Scholar position; pays $53,000. Wow. With more than 500 employees and two main campuses in Reno and Las Vegas, Nevada, DRI generates nearly $50 million in total annual revenue. As part of a non-teaching, research- and product-driven organization, DRI's faculty members are entrepreneurial, and responsible for their own salaries from external grants and contracts. New York, NY: Columbia University is looking for an "associate in discipline"; the position calls for a B.S. chemistry. Looks to be a teaching position of some sort. Gallatin, TN: Volunteer State Community College wishes to hire a M.S. chemist to be an instructor of chemistry. Princeton, NJ: Princeton is looking to hire a postdoc for the synthesis of nanomaterials: "The candidate is expected to have demonstrated proficiency in the synthesis and characterization (i.e., TEM, SEM, DLS, quantitative analysis of the data) of novel nanoscale materials, including metallic nanoparticles and semiconducting nanocrystals. The candidate should be highly self-motivated. He/she will be developing new nanoparticle-based probes and will use these new probes to explore molecular processes in living systems." Looking to revive a strugging R&D operation, AstraZeneca's new CEO has outlined a global research reorganization that will require moving thousands of its scientists and other staffers in the U.S. and Europe into key clusters while laying off 1,600 others. Part of the plan calls for the company to shutter its major research efforts at Alderley Park and invest $500 million in a new R&D complex in Cambridge, U.K., to consolidate its small molecule and biologic research in the country under one roof, as the company ($AZN) concentrates its efforts in regions where it already has a big presence. In its release, AstraZeneca says it will reduce its head count by 1,600, while relocating 2,500 jobs. The restructuring will cost about $1.4 billion. The new strategy will eliminate some 650 jobs in the U.S., with 1,200 jobs being removed from Wilmington, DE--which remains the company's North American headquarters--and 350 jobs moving to Gaithersburg, MD. Best wishes to them, and to all of us. TIPS: What advice would you offer someone interested in pursuing a career in the pharma industry today? I’m tempted to say ‘Run for your life!’ But that's not quite accurate, or not yet. What I would emphasize, though, is that it's a terrible time to be an undistinguished scientist doing drug discovery, at least in a high-wage country. The grunt work is easier to hire out to people who will do it for less money, so my advice to people is to try to give them something that they can’t buy so easily in Shanghai or Bangalore. And even as these places get more expensive, and the acute phase of outsourcing passes, the point remains that you should always have a good answer to the question ‘Why do we pay you?’ You should try, as much as possible, to be able to do some things that no one else around in the company can do, which will usually mean keeping up with new research ideas as they emerge. Or thinking up your own, of course. Other advice: you’ll probably find yourself starting with, or working at, smaller companies than you might have imagined. I think that there's a shift in the population of drug researchers, with proportionally fewer of them at the large organizations and more in the smaller ones. So you’d better be prepared to move from job to job as well, because the smaller companies are probably going to be a bumpier ride. A corollary to that is to strongly consider moving to an area that has a good startup culture, so that there's a better chance of finding somewhere else to go when and if the time comes. Well, that's all over good news. Prof. Paula Stephan spoke at the National Postdoctoral Association convention; here's the Storify. Andre the Chemist bravely asks "Is my Ph.D. worthless?" Last week, The Atlantic's Jordan Weissman got interviewed on NPR about scientists and their unemployment rates; the story includes an out-of-work recent Ph.D. grad in analytical chemistry. Hey, that's a very interesting increase in the number of BS/BA chemistry graduates! In the decade leading up to 2005, about 30 of the U.K.’s 70 chemistry departments closed in the face of waning undergraduate enrollment in chemistry and a lack of funding to teach the subject. The situation has since turned around dramatically, with about 10 chemistry departments reopening in recent years. As well as recruiting more students, many U.K. university chemistry departments are also now recruiting staff. An additional, and rather surprising, factor has encouraged more undergraduates to study chemistry in the U.K.: the economic recession that began in 2008. British students have been seeking out chemistry degrees in recent years because the subject provides relatively good job prospects, say a number of leading academics. This is in contrast to the situation in the U.S. where job prospects for chemistry graduates have been tougher of late. I'll be honest, I am less than impressed by the IER numbers, especially compared to the US data for 2010 graduates (ACS 2010 ACS Starting Salary Survey (see first table): 33% full-time, 6% part-time, 46% graduate studies). They're a little better, but not by much. As a result of outreach programs, HEFCE’s funding, and students going back to school during the recession, the number of chemistry departments across the U.K. has risen by about 10 since 2005 to 52 in 2013. Between the academic years 2004–05 and 2011–12, the total number of U.K. undergraduates studying chemistry rose 41%. For the academic year 2011–12, there were 15,660 full-time students studying chemistry in all years at the undergraduate level, according to the latest statistics available from the U.K. Higher Education Statistics Agency. The number of student undergraduates for other science subjects, including chemical engineering and physics, has also increased since 2005. A similar pattern occurred in Germany, where student numbers fell beginning in 2004, were then flat for 2007–08, and subsequently picked up again from 2009. The U.S., too, has seen a recovery in the number of students graduating with bachelor’s degrees in chemistry. According to the latest data published by the American Chemical Society, the number of chemistry graduates from ACS-approved schools has risen since 2002. That number increased 44% from 2005 to 2011, when there were 15,712 new graduates. The total number of chemical engineering students to graduate with a bachelor’s degree in the U.S. also increased but to a lesser extent than chemistry. The number of ACS-approved chemistry graduate programs at U.S. schools remains somewhere between 600 and 700. I wonder what is driving this increase? It's certainly not wages. UPDATE: LabMonkey looks at the UK numbers, which show a rise in the total number of UK undergrads as well. Jyllian Kemsley covers the science behind botanical dietary supplements. By Michael McCoy, BASF is spending a bunch of money on postdocs in Massachusetts to do polymer research. Yay? This letter on drug discovery in academia is very confusing; you mean to tell me that these researchers didn't do a SciFinder search before diving into in vivo experiments? Editor-in-Chief Maureen Rouhi covers Blog Syn! If you read this report of 2012 ACS Highlights, it's like ACS Careers did not exist, nor was member unemployment at near-record highs. Obtain seat closest to bar and food. Make sure you have good tablemates, i.e. ones that will not report your behavior. Check contents of hip flask. Bogart all needed butter, condiments. Be sure to obtain enough food/drink to last you through after-dinner speechmaking. Discreetly pull out, distribute boss speech bingo cards. Attempt to keep eye rolling to a minimum; allow spouse to kick you under table, if necessary. Count blessings that company has lasted another year to have another party. Recheck/refill contents of hip flask. What was Teva doing in Mexico, MO? In addition to the penalty, Teva will complete other actions at the facility valued at approximately $2.5 million. These include the installation of equipment to recover and reuse approximately 59.5 tons of methylene chloride and reduce other emissions by 19 tons over a five-year period. *Spent a night there on a roadtrip in 2004, actually. Cute little town. What do older/retired chemists do as their side gig? Some older Americans are passing up retirement in favor of starting businesses of their own. In fact, more than 20 percent of new businesses are started by people between the ages of 55 and 64. And one of those businesses is a barbershop in Calumet City, just south of Chicago. ...So he kept his options open. He had other businesses all during his police career — other hair salons, a taco stand, a rooming house. "I don't want to say I was an entrepreneur, but I was a hustler," Piña says. And when this barbershop came up for sale, he had the money to buy it. It had been a barbershop forever, and Piña didn't change it much. I feel like I always hear about police officers having a side gig (private security, etc.) But I hear much less often about chemists and their side careers towards retirement. Certainly, consulting or other occupations directed towards the chemical enterprise is the most common post-retirement gig. Seems to me that chemistry is a career that, if you make it to retirement, you're not going to have to work as a Walmart greeter. But, these days, I am sure that there's a lot of involuntary service industry work. So, readers, do your retired colleagues sit and home and read, or are they working? If they work, what do they do? By converting salaries to constant 1984 dollars, the average salaries for chemists (or anyone else) have hardly moved in terms of what you can buy for your money as measured by the Consumer Price Index (CPI). 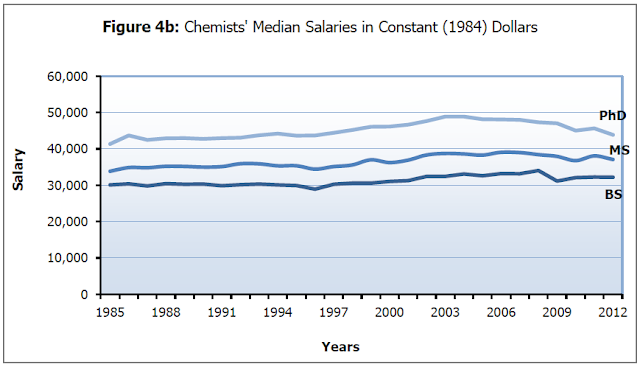 In 1985 the median salary for a chemist with a bachelor’s degree was $30,075. 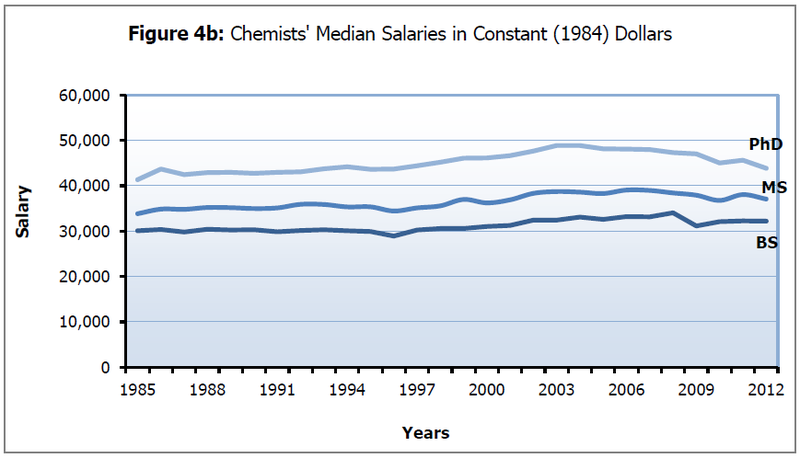 In constant 1984 dollars, the median salary for chemists with a B.S degree 27 years later in 2012 had grown to $32,194 -- an increase in real terms of $78 per year, on average. The median salary for a chemist with a master’s degree went from $33,835 in 1985 to $37,054 in 2012, or an increase in real value of $119 per year, on average. For PhD’s the increase went from $41,353 in 1985 to $43,861 in 2012, or $93 in real buying power per year on average. Keep in mind that the median represents the salary in the middle of the range. Most chemists reading this who were working in 1985 were probably just starting out and were most likely making a salary in the bottom quartile. Today, those same chemists are likely to be making salaries in the top quartile and they have accumulated a substantial gain in buying power even in 1984 constant dollar terms. UPDATE: Respected reader Polychem points out that the 2012 Salary Survey report also includes a section on consulting wages (page 12), all of which are a good bit higher than $25/hr. Hey, isn't this like a postdoc for lawyers? ...The result is a nonprofit law firm that Arizona State [University] is setting up this summer for some of its graduates. Over the next few years, 30 graduates will work under seasoned lawyers and be paid for a wide range of services provided at relatively low cost to the people of Phoenix. The Arizona State approach, called the Alumni Law Group, appears to be the most ambitious because of the number of lawyers it will employ (30), its projected cost (a commercial firm of comparable size would cost $5 million a year to run, according to the school’s projections) and its hope to be self-sufficient in a couple of years by charging for its services and gathering donations. ...The plan is to have four to five groups of lawyers each overseen by a full-time, salaried supervising lawyer serving a range of clients. The firm will do legal work for other parts of the university, including its high-tech innovation center. The aim is to charge $125 an hour in an area where the going hourly rate is $250. The school also says it wants to reach out to veterans, Hispanics and American Indians whose legal needs are not well met. ...Arizona’s plan, mooted at bar meetings and within law school circles, is producing envy — but also skepticism. Some see a naked attempt to improve the school’s ratings in U.S. News and World Report by increasing the percentage of its graduates who find work while doing little to address the access-to-justice problem. Surprise! The Ladders is being sued for being a scam. "From its inception until September 2011, TheLadders scammed its customers into paying for its job board service by misrepresenting itself to be 'a premium job site for only $100k+ jobs, and only $100k+ talent'. In fact, TheLadders sold access to purported '$100k+' job listings that (1) did not exist, (2) did not pay $100k+, and/or (3) were not authorized to be posted on TheLadders by the employers." Granted, it's being brought by a big law firm, etc. I'll be very interested to see how it turns out. Good morning! Between March 12 and March 13, 20 new positions were posted on C&EN Jobs. Of these, 4 (20%) were academically connected. Dallas, TX: Abbott is looking for a B.S. chemist for a physical chemistry pos-- wait, they really want a Ph.D. inorganic chemist for a systems engineering position. Look, they have no idea what they want, except that it has to do with "ion-selective electrodes." I think that's your best bet. Sunnyvale, CA: The City of Sunnyvale is hiring a senior environmental chemist, paying $75k-95.8k. Not bad work, if you can get it. Kalamazoo, MI: Kalsec is hiring a lead analytical chemist, preferably a Ph.D. with process analytical technology experience. It sounds like a nice place to work. Tarrytown, NY: Kraft Foods is searching for a Ph.D. physical chemist; 5 years food science experience desired. Freeport, TX: BASF desires a B.S./M.S./Ph.D. chemist to be a process development chemist for a polymer plant, looks like. Woodside, NY: AXEL Plastics Research Laboratory wishes to hire a Ph.D. polymer chemist. Josh Bloom wrestles with Facebook; man, there are a lot of ignorant people. Who's the pope of organic chemistry?, Paul wonders. This DrFreddy post on CYPs is fantastic. I would love to know what's going on with this API manufacture request at In The Pipeline. Interesting post on flash chromatography of hydrophilic compounds at Practical Fragments. I loved this Ash post on the gate that led to the Manhattan Project. Andrew Bissette has blogging up a storm at Behind NMR Lines. This UK thallium/arsenic poisoning case is weird; I don't get it. No chemicals on John's work van. This Lauren Wolf post on the neuroscience of magic was neat. Glen Ernst talks about a troubling postdoc tradition. Labsolutely does the best picture posts. Andre The Chemist: just keep scrolling. See Arr Oh wants to know: where are the under-40 biotech billionaires? I think the idea of this sort of weighted formula ranking is really fun, but sort of quixotic. If you click through it, you see that they actually ranked the above cities 1 (Boston) through 21 (Atlanta). 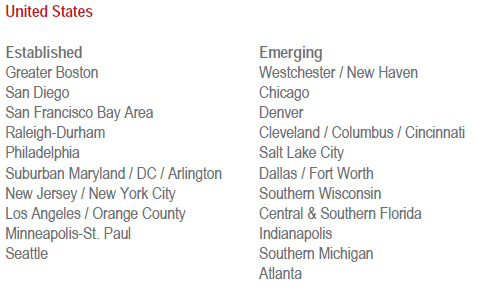 What is it about Seattle that makes it "established", while Westchester/New Haven, CT is "emerging"? Should New Jersey be lumped in with New York City? How is Cleveland the same biotech hub as Cincinnati (distance of 249 miles)? How about southern Wisconsin and Chicago (90 miles)? Where's St. Louis? Is the canoe wood or aluminum? If I were to do this sort of thing, I would basically narrow it down to 2 cities, Boston and San Francisco, and then everyone else. They're not giving up their crowns any time soon, either -- if anything, it seems like Boston/Cambridge is consolidating its gains. In the Great Recession years, how many life scientists moved to Boston as opposed to moved away? Either way, it seems to me that people who might want to work in the biotech industry would be well advised to make sure their educational institutions (and the networks (ugh) within those institutions) filter into the above hubs, and (as a safe bet), probably the "established ones." Also, note the relative position of the industrial Midwest or the Mountain West in these rankings -- sigh. Do we think that they will emerge by 2020? Process Wednesday: too much surface area! The high cost of utilizing zinc-copper amalgam led to the develop of a cheaper process employing various forms of metallic zinc (mossy, rods or foil.) The reaction was performed using ultrasonic irradiation, thus requiring no chemical activation of the zinc. This method also help to eliminate the delayed exotherm, and the reaction time and yield were more reproducible. Initially, the reaction was performed using zinc powder which often led to excessive foaming. This was replaced with a solid piece of zinc, which not only reduced the foaming, but also dampened the exotherm due to a decrease in the reactive surface area. The zinc block could be removed at any time to slow the reaction. At the conclusion of the reaction the zinc block was conveniently removed from the mixture before workup. Interestingly, on a 1 liter scale, zinc paddles attached to the glass stirrer shaft were tested. Even though they partially dissolved throughout the reaction, an excess of zinc was used in the design so that efficient stirring continued to the end of the reaction. This curious design was later replaced with zinc cones, a shape that provided a practical surface area to weight ratio. Reddit Chemistry Jobs FAQ, part 3: Does your Ph.D. granting institution matter? czechychicky: How important is a PhD supervisor vs. university at which the degree was obtained? chemistress: How much does the graduate school you attend matter? Will I seriously be hurting my future job prospects if I receive my PhD from a (much) lower-ranked school? The old adage is that your terminal degree/experience should be the best one possible. There's a lot of caveats there, but I think that's it is broadly true. Here's how I look at the difference between an adviser and the institution when it comes to jobs: your institution will help your CV (the "prestige" factor, networking, potential internships with nearby employers, other professors to be your references, facilities), while the interaction between you and your adviser is what makes your thesis and makes your job talk. Which is more important in getting your job? I would hope it's your science and your skills, but let's not be too naive. It's probably best to maximize both. Will you be hurting your job prospects if you get your Ph.D. from a lower-ranked** school? I don't really know, but there is probably a wide gulf in the distribution of job offers and salaries between graduates of, say, the top 5 or 10 institutions (the Harvards and the Caltechs of the world) and everyone else. Is there a big difference in salaries and lifetime earnings between the 50th ranked school and the 100th ranked school? Possibly, but again, I don't really know. It is also quite possible that if you get a Ph.D. from a lower-ranked school, you're probably increasing your chances that you might need a postdoctoral stay at a higher-ranked school to polish your CV. There's something that I haven't mentioned yet, which is success. It's a really difficult thing to define, but it will probably mean 1) publishing a lot of good, well-regarded science and 2) learning to be a high-quality, independent scientist. I think that's hard to do anywhere, but some institutions and professors fit you and your personality more than others. So that's going to be my spin on the above adage: you should go to the best school that will help you be the most successful. *UPDATE: Experienced commenters disagree with me and seem to agree that in industry, the school matters more than the adviser name. **Whose rankings are we going to use, for that matter? How much should you charge for your services as a consultant? Let's say that you had a unique skill set, one that gets you paid $50,000/year. If you decided to leave your field but be willing to take occasional consultant gigs, how should you charge for it? But that's probably foolish, and why I would starve quickly if I were a consultant. So, readers, if you're a consultant, how should you charge for your services? UPDATE: Let's just say that the comments are in agreement that my suggested rate is far too low. You should read them, and ignore me. Good morning! Between March 7 and March 11, there have been 25 new positions posted to the C&EN Jobs website. Of these, 9 (36%) are academically connected. Anchorage, AK: SGS North America is seeking a lot of positions; here's one for a project manager in an analytical laboratory in Anchorage. (Fun!) 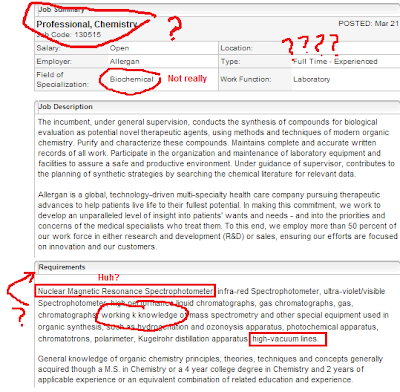 Odd how that Anchorage project manager position doesn't show up on their website, but this lab tech position does. Greenville, SC: Our old friend IRIX is posting for a senior analytical chemist (MS/Ph.D.) with cGMP experience; 85-100k offered. I know that it's going to be difficult to find academic experience for some of these items (i.e. refining), but it's nice to see employers attempting to stretch definitions here. China Corner: I see that WuXi is hiring for more positions; I'm amused to note that either Chinese or Japanese language skills are desired for at least 3 of them. ACS NOLA watch: 35 positions for the Career Fair, 5 for the Virtual Career Fair. Non-compete agreements in the chemical industry?